Amazon Inc.'s (AMZN - Get Report) $13.7 billion industry-transforming acquisition of grocer Whole Foods (WFM is putting the takeover spotlight on Hain Celestial (HAIN - Get Report) , the only remaining publicly traded pure-play natural- and organic-food company. WFM is Hain's largest customer (indirectly), and it's where HAIN sells a variety of organic products, including well-known brands Terra Chips and Celestial Seasonings teas. "Whole Foods has not been doing that well from a sales perspective," said Amit Sharma, analyst at BMO Capital Markets. "If Amazon can turn that around, it would be a boost to Hain because [Hain] is one of the largest suppliers to Whole Foods." Akshay Jagdale, analyst at Jefferies, agrees, noting that he thinks the market is missing the potential positive impact on consumption, assuming Amazon is successful in gaining share in the natural- and organic-food space. However, even more importantly for shareholders is that Hain also has an activist investor at its gate. Engaged Capital's Glenn Welling launched a campaign last week that included the beginnings of a rare change-of-control director election battle at Hain. If successful at taking control of Hain's board - Welling seeks seven of eight director slots -- it is extremely likely that Engaged will seek to bolster sales through investment in promotion at the same time that the insurgent fund seeks to find a buyer for the company or some of its brands. Welling has already taken a big step towards victory by accumulating a 10% stake -- and his track record suggests that some of Hain's big institutional investors already have his back. As far as acquisitions go, some traditional packaged food companies could be interested in Hain or some of its brands, as they seek to increase their exposure to organic foods. These include PepsiCo Inc. (PEP - Get Report) Campbell Soup Co. (CPB - Get Report) , Hormel Foods Corp. (HRL - Get Report) , General Mills Inc. (GIS - Get Report) , Kraft Heinz Co. (KHC - Get Report) , Nestle SA, and Unilever NV (UN - Get Report) . 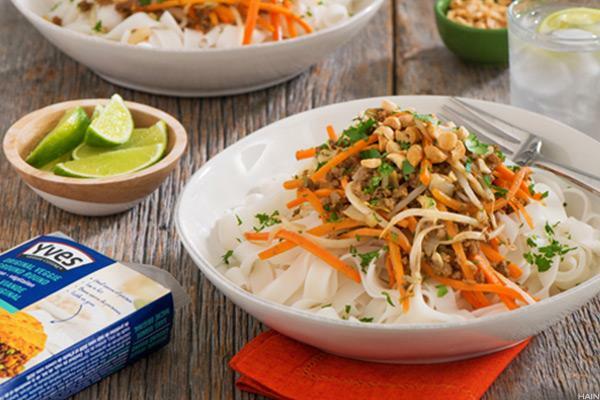 A Hain auction would follow France's Danone SA's $12.5 billion acquisition of organic foods company WhiteWave Foods Co.
"It is easy to see why traditional packaged-food companies want to buy organic-food businesses," said Sharma. "Organic natural foods are growing at 8% to 10%, while traditional packaged foods are hardly growing. Conceptually, it makes sense for these companies to want to buy Hain, which could be that growth for them." Also, consider also that Engaged, based in Newport Beach, Calif., has a mostly successful track record when it comes to organic- and healthy-food companies and M&A. Boulder Brands, which makes Earth Balance and Evol Foods, was sold to Pinnacle Foods in 2015 shortly after Engaged became involved. Also, Engaged Capital helped negotiate an $85 million investment by Oaktree Capital in October at Canadian natural- and organic-foods processor SunOpta Inc. (STKL - Get Report) , an investment that helped drive the company's shares up to its recent price of just under $10 a share (from about $6 at the time). Engaged has been successful at driving recent sales of companies in other sectors, including Redbox kiosk maker Outerwall Inc.'s sale to Apollo Global Management for $1.6 billion and medical device maker HeartWare International Inc. purchase by Medtronic plc (MDT - Get Report) for $1.1 billion. Alternatively, Engaged Capital could help drive Hain to sell some of its brands rather than the whole business, as a means of raising money for stock buybacks or dividends. Oppenheimer & Co.'s Rupesh Parikh said he cannot rule out divestitures though he was hard pressed to envision a sale of the entire company given that the "complexity of the organization may be less attractive to many buyers." A key driver behind Welling's campaign and the company's potential M&A future is its move on June 22 to issue its 2016 annual report, after 13 months without filings after the company corrected what it said were "immaterial errors" for prior period financial statements. Its revenue is down slightly so far this year, and its profits dropped recently by half, compared to the company's results over the same period last year. Nevertheless, the situation seems to be coming under control, which means Welling could drive a sale. "Most people have accepted that there was a problem and that problem was resolved," said Sharma. "It is not seen as a bar to invest in Hain. The focus has shifted to growth and margin and earnings and how much of that is recoverable in fiscal 2018." If successful, Welling is also likely to push Hain to invest more in advertising and promotion behind its brands, according to people familiar with the situation. BMO's Sharma notes that some observers believe that Hain should spend more on promotion, particularly as competition from rivals and private label brands, such as Whole Foods 365 and Target's Archer Farms, heats up. Things could start to get interesting around November, which is when Hain usually holds its annual meeting. A Welling takeover or even a settlement putting some Engaged directors on Hain's board would likely mean M&A is next. But Welling could seek to replace directors even sooner if he can get the 25% stake together needed to call a special shareholder meeting. (He only needs 15% of shares to back such a move). Nevertheless, Hain has survived -- and remained independent -- after it faced a big time activist investor in the past. It came under pressure by Carl Icahn in 2010, who succeeded at appointing two nominees, his son, Brett Icahn and a managing director, to the company's board. Icahn liquidated his stake in September 2013 after the company's shares rose by 45% that year -- and the fund's directors no longer serve on Hain's board. A Hain spokeswoman declined to comment.